The week that brought Wigan Athletic its greatest moment in football has ended in sadness as the club’s eight-year Premier League history has been placed in the to-be-continued pile along with so many others. Few Wigan supporters will feel anything but overwhelming pride tonight despite being relegated, as an injury-plagued and thoroughly exhausted squad gave Arsenal a real scare amidst rainy scenes at the Emirates. With the scores equal in the second half, it was Wigan playing the better football, narrowly failing to take the lead on several occasions before an Arsenal counter-attack swung the match and ultimately put Latics down. Ensuing weeks will address questions about who will stay and who will go. For the time being, it is safe to say that the work of Roberto Martinez’s staff has ensured that Wigan is in very strong shape to bounce back in short order. When the club was first promoted in 2005 there was little in the way of youth development or reserves. Times are different — so much Latics progressed through the FA Cup using squad and youth players and, despite a number of injuries to key players, won the bloody thing. 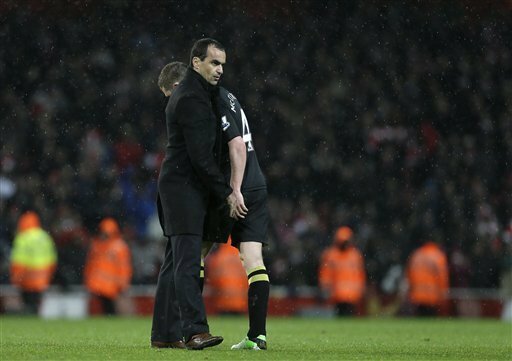 Many have been mystified by Martinez’s Wigan. Capable of beating absolutely anyone on their day — often in style — they have found themselves embroiled in relegation battles more times than not in the Premier League years. Why wait until the final stretch to get going? The yearly process of replacing first team players lost in the summer window plays a key role and certainly did this season. Not until the rise of Callum McManaman a couple months ago were Wigan able to replace the direct and skillful Victor Moses. But the funds raised from the Moses sale are exactly what have aided the rise of young players like McManaman and the purchases and development of talents such as Roman Golobart, Nouha Dicko and others that may become key players in the Championship next year. Those sales and that period of rebuilding were necessary for the model. Wigan have taken a gamble with said strategy for the past number of years and it has paid off, allowing the club to maintain Premier League status while building behind the scenes. This year, they lost the gamble with Premier League salvation, but Wigan won the FA Cup and qualified for European football for the first time in the club’s history, a stunning achievement. True to form, Wigan Athletic have been relegated in what is arguably the club’s most successful season ever. On the pitch, the obvious deficiencies this season were defensive. Last year’s player of the season and club captain Gary Caldwell was dogged by a troublesome hip injury from beginning to end, the excellent Antolin Alcaraz missed more than two thirds of the campaign, new signing Ivan Ramis has been out since January, while Maynor Figueroa, Jean Beausejour and Ronnie Stam were all injured in the crucial final stretch. Ali Al-Habsi, so influential in previous seasons, made several high profile mistakes and was dropped. Fixture congestion — with the FA Cup final played only three days before today’s match — certainly didn’t help. When yet another influential player, McManaman, went off injured in today’s match, you got the sense it was the final straw for Martinez’s ailing squad. So an end has come to Wigan’s memorable maiden Premier League voyage. Detailed analysis will follow but the lingering feeling remains that of pride in the achievements of a small town club that has graced the Premier League with unpredictable, exciting football over the past decade, climaxing at Wembley last Saturday. Today is a sad day, but keep an eye on those plucky Latics and their unique brand of underdog football — they’ll be back.